COLUMBUS – Visitors are invited to walk, shop and sing their way through Capitol Square this December at the Ohio Statehouse. The December celebration will include special holiday tours, concerts and the annual Holiday Festival and Open House. 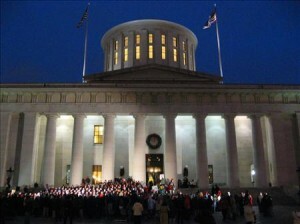 The Ohio Statehouse will hold its Holiday Festival and Open House on Wednesday, December 1, 2010. The free and public event will be held from 5:30 p.m. to 7:30 p.m. Dating back to 1915, the Ohio Statehouse Holiday Festival has brought people together for celebration, entertainment and learning at the People’s House. Guests will welcome Santa when he arrives at the Ohio Statehouse by helicopter at 5:30 p.m. on the West Plaza lawn (High Street side). For children and adults of all ages, the family-friendly festival will also include holiday music sung by a variety of choirs, a Santa and Mrs. Claus photo station, activities, displays, special performances, refreshments and much more! Visitors are asked to bring a nonperishable food item to be donated to the Mid-Ohio Foodbank. Non-perishable food items will be collected from December 1 through December 3. Media support for the Ohio Statehouse Holiday Festival and Open House is provided by Columbus Media Enterprises. More information at www.OhioStatehouse.org or by calling 614/752-9777. One of this year’s specialty gifts is an Ohio Buckeye Tree. Show your Ohio pride and give a Buckeye Tree this holiday season. Order the tree now and pick it up in April during “Earth Week,” April 18-23, 2011. A purchase will include a certificate with a holiday gift folder; perfect for under the holiday tree. Buckeye Trees are 2 ½ to three feet tall and are only $33 each. Ohio Statehouse visitors are invited to stop in the Ohio Statehouse Museum Shop during the annual “Candy Cane Sale,” December 6 to 11. Visitors will have an opportunity to draw a candy cane and receive a discount from 10 to 40 percent off their entire purchase of unique, Ohio merchandise made by Ohio artists and businesses. The following exclusions do apply: Wine, Consignment Items, Buckeye Trees, all Statehouse Holiday Ornaments, Governor’s Residence Holiday ornament; Statehouse McCoy Bank. Not to be combined with any other discounts. Sale limited to quantities on hand. The holidays are a perfect time for visiting friends and family to take a trip to the People’s House for a holiday tour on Capitol Square. Guests are invited to “step back in time” during a free guided tour of the 1861 Statehouse and see holiday decorations the way they were in Victorian times. Walk-in tours of the Statehouse meet in the Map Room, easily accessible from the Third Street entrance, on the hour on weekdays at 10 a.m., 11 a.m., 1 p.m., 2 p.m. and 3 p.m., and weekends at noon, 1 p.m., 2 p.m. and 3 p.m. There will be no noon tour during weekdays due to the free noon holiday performances. The Statehouse will be closed on December 24, 25, 26 and 31 in observance of the holidays. Visitors are invited to enjoy the holiday season with free lunch-time concerts. Weekdays from November 29 to December 17 (and December 22), Ohio musical groups are scheduled to perform songs of the season at noon in the Crypt of the Ohio Statehouse. The concerts are free and open to the public.